Please consider making a donation to this groundbreaking initiative that draws attention to animal welfare issues around the world. Chico and Benben are sun bears. The peaceful existence of these two young cubs in the depths of the Sumatran rainforest ended the day their mothers were snared by poachers. The poachers would have found Chico and Benben clinging on to the bodies of their dead mothers or hiding nearby. Once inside a dark crate, they were taken out of the forest and hidden in the luggage compartment of a bus heading to the harbour in south Sumatra. From here they were smuggled to Java, Indonesia’s main island, and traded as pets. Once in Java, Chico and Benben were far from their homeland of Sumatra. Chico was two years old when he was rescued from a cage in Jakarta, Indonesia’s capital city, where he was being kept as a pet. He was severely distressed and unhealthy, so was immediately taken to Tegal Alur, a transit rescue centre next to the quarantine station at Jakarta airport where he was given the care he desperately needed. Benben was only nine months old when he was confiscated from an illegal wildlife trader in Bandung, west Java. He was taken to the Cikananga Wildlife Rescue Centre for treatment and this has become his permanent home. Benben would have qualified to enter a rehabilitation programme due to his young age, but sadly there was no facility that offered this. This means he will live in captivity forever. Sadly this is the case for most rescued sun bears. Although confiscated from the hands of wildlife traders and debilitating small cages in households, they are forced to spend the remainder of their lives in enclosures at rescue centres, zoos and sanctuaries. Confiscated baby sun bears deserve to once again enjoy freedom in the wilds of the Sumatran rainforest. 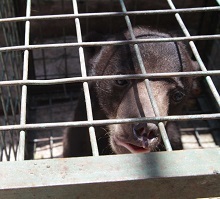 With your help, we will rehabilitate rescued sun bears and release them back to the wild. 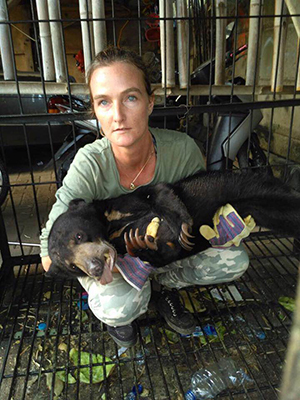 Femke den Haas, our World Animal Day Ambassador in Indonesia, heads the Jakarta Animal Aid Network (JAAN) and, for many years, the Indonesian authorities have requested their help to put a stop to the trafficking of baby sun bears from Sumatra. The information that JAAN has collected over the years indicates that around fifty baby sun bears, all under a year old, are traded each year. Once the baby bears arrive in Java, tracing and confiscating them is difficult, which is why the focus needs to shift to stopping them from leaving Sumatra in the first place! A couple of months ago JAAN purchased 6,000 square metres of rainforest in southern Sumatra to set up a rehabilitation centre. The location was specifically chosen as it is close to the harbour from where the bear cubs are smuggled to Java. Confiscating the baby sun bears at the port means they will only recently have been taken from their natural habitat. This will greatly increase the chance of successful rehabilitation and release back to the wild. Image: Femke with Chico when he was rescued. Femke and her dedicated team are on the brink of being able to realise this much-needed sun bear rehabilitation centre, but your help is desperately needed to make this dream a reality. We’re appealing for your assistance to build two forest rehabilitation enclosures for sun bears. The enclosures will simulate the rainforest that the cubs love and know so well, allowing them to feel as if they’re living in the wild. Without mum around, it’s important the baby bears are fully rehabilitated and kept safe until they are old enough to take care of themselves, before being released back into the rainforest. JAAN collaborates with the Ministry of Environment and Forestry, and Wildlife Crime Unit of the National Police to arrest and prosecute bear traders and poachers. Once the forest rehabilitation enclosures are built, the team will work 24 hours a day at the harbour. This stricter enforcement regime will help ensure that not one baby sun bear leaves Sumatra. A huge goal, but one that’s definitely worth fighting for, as I’m sure you will agree. Although too late for Chico and Benben, between six and sixteen cubs are expected to be brought to the new facility in the first year. 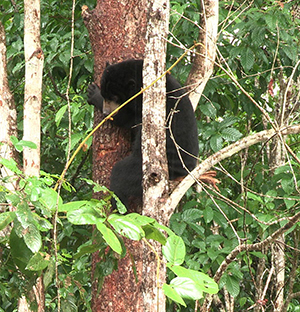 This brings hope for the future of Sumatra’s dwindling sun bear population. JAAN aims to release at least six cubs in the first year and we will follow their stories so you can see what your donation has helped achieve. We’re very excited about this project and we’d love you to be part of it. 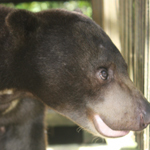 Please join us on the journey to help Sumatra’s sun bears. Check out few interesting facts about sun bears.